Okay, a while back I happened upon a yarn sale.I did some color organization while in the store, and got some assistance from the lovely staff there too. And then I dug out the rest of my stashed Nature Cotton and Savannah Bulky and oh, look there's some Blue Sky Alpaca Cotton too. And I stacked them up on my air unit thingy and I played. I have to say the sight of all that yarn sitting there was a joy to behold. 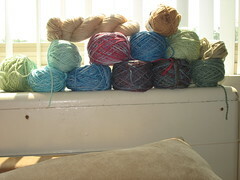 This year, instead of a holiday tree, I might make a yarn tree to show off my stash. This was the final tower. 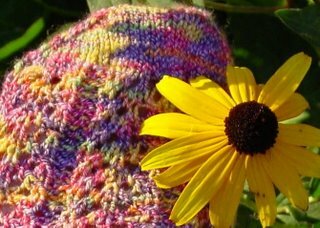 I had a pattern in mind, Emerald which I already knew, from some Ravelry scoping, looks lovely in bulky cotton. 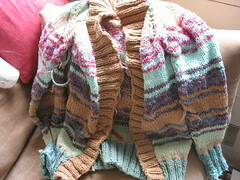 At one point I was trying to decide whether to reuse colors, so I cast on the sleeves to see how much yarn I had left. I decided to continue on with new colors, although with a tweak to the color changes, I probably could have made it work. But I like what I did. So, now I'm sewing up sleeves. 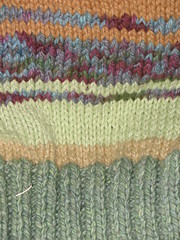 I was too lazy to create separate balls of yarn so I knit the sleeves flat so that's the bulk of my finishing. And possibly a final block. I should have tried it on, before finalizing button placement, I may get a toggle once I'm done to make it easier to change. So pretty! I love the colors. It looks like it will go with just about anything.